I’ve been receiving encouraging responses to our book, Defying Poverty with Bicycles, the inspiration for this blog. 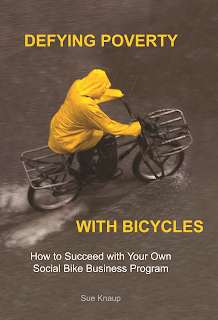 Readers are taking the trouble to contact me and describe how they have used the book to build their own social bike business program. Many of these readers were helping to lead small, volunteer-run programs before they got their copy. Now they are doing the work needed to create an infrastructure that can handle growth. This growth will allow them to serve many more disadvantaged people with bicycles than they did before. “Because people who live in or even near poverty are so consumed by the daily stress of survival they cannot engage in society. This often means isolation from community activities and even well-meaning programs designed to serve them. Unfortunately, such charitable service programs neglect to actually engage the people they are meant to serve, the very people who understand the struggle and language of their neighbors. The Social Bike Business program is designed to bridge all of these gaps by guiding struggling people toward their own entrepreneurial success. Advantaged people are well served by bike shops, collectives and co-ops. Now it’s time to create the places that invite our most disadvantaged neighbors to purchase their own bike—refurbished or manufactured locally through the program—and engage in a new career that will enable them to lift themselves out of poverty. Even obtaining a quality transportation bicycle can save a person several hours each day if they had been walking and save them thousands of hard-earned dollars each year. Bicycles shrink cities at no charge. But this program does far more than that. It establishes bicycle community centers where struggling people can learn from each other about transportation bicycling and careers in bicycle business and beyond. 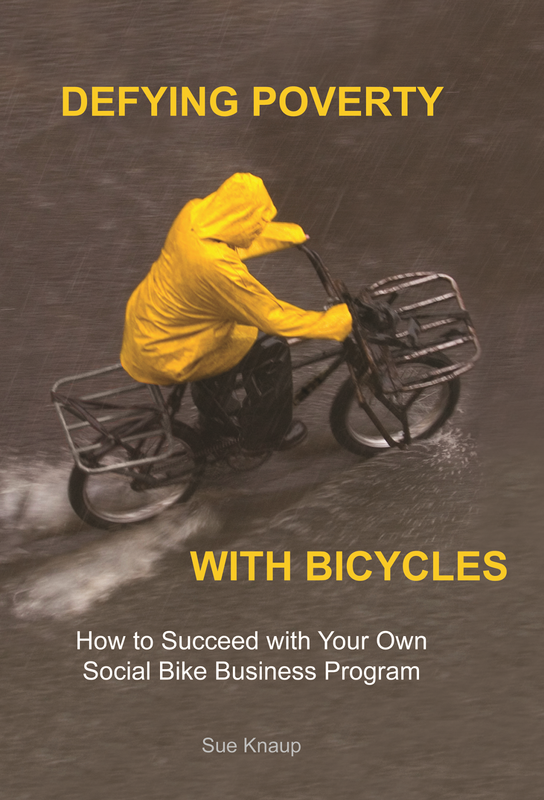 In the following chapters, you will learn how to plan for and launch your own Social Bike Business program, adapted to the needs and specialties of your particular community to ensure you reach your most disadvantaged neighbors. Your program can be as small as needed to succeed or as immense and complex as you believe you and your team can achieve. Think of this book as a menu to pick from rather than a prepared meal. Start where it makes sense for you and your team and go as far as you need to go. You might already have a small shop that would suffice as the main center for your program, so keep this in mind as you read about large centers designed for larger programs than yours needs to be. You and your team might want to focus on job training and refurbished used bikes. Then skip the chapter on bicycle manufacturing. This book is yours to do with what you like. Pull out the pieces that sing to you and shut the volume off on all the rest. As you read, you will learn how to place the most disadvantaged people first and how to help them purchase their own bike through micro credit and subsidy qualification so they will value their bike. You will learn how to spot talents in people and offer a variety of career paths all based on bicycles, but designed to help them find work in many different fields, from business management to customer service to mechanics to owning their own business. You will learn proven business practices that ensure all employees of your program are paid a market rate salary. You will find ways to overcome the relentless stress and fear of poverty. And from this insight, you will learn how to choose the most effective means of reaching and engaging your community’s most disadvantaged residents—their preferred way of communicating, the locations most inviting to them, what they need in order to attend a meeting or workshop including food and childcare, and many more vital details that are commonly forgotten in today’s bicycle businesses and programs. Be sure to study Chapter 1 because that is where you will have to be honest with yourself and your local leadership team. Are you envisioning a more casual and fun volunteer program that gives bikes away? A co-op or collective might be a better fit. Such programs can build the bike culture. You might also be a budding for-profit business owner. For-profit bike shops are necessary elements of every bicycling community and a very honorable path to take. If you choose Social Bike Business, one important requirement is that you must live in the community and be prepared to help lead the organization that takes on the program. I have encountered several well-meaning people who are enthusiastic about the program but expect others to take it on without their assistance. They see its potential in another community or believe that an organization they do not lead should take it on. In fact, the only way for you to succeed with the program is to step into a leadership position and inspire others to join you in building this program so it serves the community where all of you live. No program can thrive if it is started or run by outsiders. We understand that Social Bike Business is not for everyone and, in order to succeed, each local program must compliment rather than compete with existing for-profit bike shops and co-ops/collectives. Each Social Bike Business program must fill an unfilled niche. That niche is service to and full engagement of the most disadvantaged people in each community. By filling that niche, Social Bike Business is designed to enable people to find their own path out of poverty through bicycles. Eighty percent of the world’s population is living in poverty (World Bank 2008). The Social Bike Business program opens a world of opportunities to them through bicycling. For this, they will continue to ride and perhaps even take up sport cycling. This will grow the whole bicycle movement and boost the bike industry as these formerly-poor join the advantaged bicycle enthusiasts of their community. Does that sound intriguing? You can buy your copy at any book vendor – local book store or online – or buy it through our website at www.OneStreet.org . Do you already have a copy? Please leave a comment about how you have used the book to build your program.